244 pages | 43 B/W Illus. Brazil, Russia, India, and China (BRIC) are among the largest and fastest-growing economies in the world. The enormous size of the customer base in these emerging markets is the strategic concern of global business firms. Successful market performance in these markets requires sound understanding of dynamic environmental factors and timely investment of appropriate resources. This book presents strategies for recognizing the challenges and optimizing the opportunities for building network capabilities and competitive advantage within the context of these emerging markets. Building Network Capabilities in Turbulent Competitive Environments provides a thorough review of the literature and an unparalleled abundance of fascinating case studies featuring Japanese, Korean, and indigenous business examples. To gather real-world information, research teams made numerous field visits to many firms in the BRIC markets to meet and interview executives and observe their manufacturing and supply chain practices. The information in this book is presented within a fully formulated theoretical framework of three core competencies: technology competence (capability to offer innovative products that fit these markets), customer competence (capability to understand and satisfy different customer needs), and linkage competence (ability to integrate technology and customer competence). The book also covers the concepts of product architecture and supply chain management to provide a more in-depth analysis of global firms operating in BRIC markets. "BRICs have increased their influences on the entire world economy since the beginning of this century, but there have been relatively few studies that focused on their critical industrial issues, such as global supply chain management, by applying a consistent analytical framework to all these countries. Dr. Hong and Dr. Park made a remarkable number of case studies on Korean and Japanese global firms and their BRICs operations with a model of adaptations between product architecture and technology-customer-linkage capabilities. The balance between their tenacious fieldwork and logical thinking has made this seminal book’s arguments persuasive to both researchers and practitioners in the field of global management." "This book introduces the secrets of success by Korean and Japanese firms in the BRIC markets where the uncertainty and turbulence of the business environment presents unprecedented challenges for global business firms. I am very sure that this book will provide a lot of interesting and insightful lessons for the broad spectrum of audiences as well as CEOs and executives." "If your organization wants to be successful in our turbulent, competitive international marketplace then it is imperative that you know and understand your own capabilities, competencies, and capacities in formulating and executing your organization's global strategy. Drs. Park and Hong have given us a tremendous toolkit that can help corporate executives, consultants, and academicians better understand the elements needed for real success on the world stage. This book is a must read for executives, researchers, and students who are serious about expanding their knowledge and understanding of how to create competitive advantage in the global marketplace of the twenty-first century!" "This rare book covers the emerging global businesses of BRICs and their key success factors for competitive advantage. This is based on extensive field visits along with a solid theoretical model. In view of the enormous economic potential of Brazil, Russia, India, and China, Dr. Hong and Dr. Park's book addresses crucial issues that many global firms face. I highly recommend this book to both academic researchers and business leaders." "Many of us frequently talk about globalization, but do we really understand the dramatic implications for our organizations and supply chains? What specifically must we do to maintain or grow our competitive position in today’s global network? Building Network Capabilities in Turbulent Competitive Environments, the second volume highlighting business success stories from the BRIC countries, is an important read for business executives, research thought leaders, and ambitious students interested in understanding global trends toward collaboration, but more importantly the strategic implications of these trends. If you are interested in reading about global trends, there are many books to choose from, however, if you are interested in learning about strategic actions that have led to success in emerging markets, then this is the book for you!" "If you have hit against the wall when it comes to global market strategy ideas, Building Network Capabilities in Turbulent Competitive Environments is one of the best-recommended reference books for academicians as well as practitioners alike who are looking to be adaptive to the ever-changing global market strategies necessary to thrive." "This book presents a unique overview of the strategies implemented by leading firms operating in the immense and fast-growing markets of Brazil, Russia, India, and China (BRIC). The peculiarity of the book is the comparison of Japanese and Korean global firms with BRIC indigenous ones, by means of case studies of leading brands, thus allowing the understanding of the different strategic choices and their outcomes. A sound theoretical framework is provided at the beginning of the book, to help the reader in interpreting the various cases. This makes the book interesting for both managers, students, and researchers." 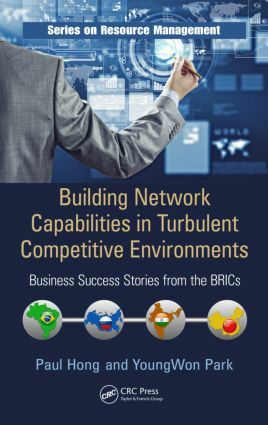 "The second edition of Building Network Capabilities: Business Success Stories has expanded its scope to provide a valuable, theoretically driven and practical guide to developing network capabilities in the rapidly influential BRIC economies. In today’s dynamic and globally competitive business environment, organizations need to be able to adapt quickly to a variety of internal and external hazards. Hong and Park provide examples of how companies are doing this, in both the fast-paced BRIC markets and in more established markets, and describe the network requirements needed to do this successfully. Useful for researchers, students, and executives, this text fills a gap in the business press, and is a valuable reference tome for academics and practitioners alike." Dr. Paul Hong is a professor of operations management at the University of Toledo, USA. He holds a PhD degree in manufacturing management and engineering from the University of Toledo. He also holds an MBA and an MA in economics degree from Bowling Green State University, USA and a BA from Yonsei University in Seoul, Korea. He has presented and published more than 200 articles in conferences and journals including Journal of Operations Management, International Journal of Production Research, Corporate Governance: An International Review, Journal of Supply Chain Management, Benchmarking: An International Journal, British Journal of Educational Technology, Strategic Outsourcing: An International Journal and European Journal of Innovation Management, Journal of Production Economics, International Journal of Operations and Production Management, Journal of Business Research, International Journal of Technology Management, International Journal of Information Management, Management Decision, Journal of Cleaner Production, Journal of Purchasing and Supply Management, Journal of Service Management, and Business Horizons. He is the recipient of Journal of Operations Management Best Paper Finalist Award (2006) for the paper, "Role Change of Design Engineers in Integrated Product Development)," Emerald Literati Network 2011 Awards for Excellence for the paper, "Integration of Supply Chain IT and Lean Practices for Mass Customization: Benchmarking of product and service focused manufacturers," and Best Paper Awards on "Flexible and Redundant Supply Chain Practices to Build Strategic Supply Chain Resilience: Contingent and Resource-Based Perspectives" and "Using Social Media for Competitive Advantage: An Empirical Study" at Annual North American Research Symposium in Tempe, Ariz. 2012 and 2013. He is an editorial review board member of several journals including Journal of Operations Management, Journal of Humanitarian Logistics and Supply Chain Management (JHLSCM), and Journal of Enterprise Information Management (JEIM). Since 2006, he has been special issue editor for journals such as Benchmarking: An International Journal (BIJ), International Journal of Business Excellence (IJBEX), International Journal of Services and Operations Management (IJSOM), International Journal of Procurement Management (IJPM), and International Journal of Production Economics (IJPE). He is conference chair and international network coordinator of annual International Symposium and Workshop on Global Supply Chain, Intermodal Transportation and Logistics—4th Symposium in Madrid, Spain, 5th Symposium in Tokyo, Japan and 6th Global Supply Chain Conference in Dearborn, USA. His research interests are in business ecosystem innovation strategy, global supply chain management, and international comparative studies. Dr. YoungWon Park is an associate professor of GCOE Project of Manufacturing Management Research Center at the University of Tokyo, Japan. He holds a PhD degree in the Department of Advanced Social and International Studies from the University of Tokyo, Japan. His articles have been published in journals including Management Decision, International Journal of Production Economics, International Journal of Technology Management, International Journal of Information Management, Business Horizons, Journal of Business Research, Benchmarking: An International Journal, International Journal of Services and Operations Management, International Journal of Logistics Systems and Management, International Journal of Business Excellence, International Journal of Procurement Management, Akamon Management Review, Japan Academy of International Business Studies, Japanese Society for Science and Technology Studies, and the Japan Society of Information and Communication Research. He has received research awards including Dissertation Paper Awards from the Japan Association for Social Informatics (JASI), Best Paper Awards from The Japan Society of Information and Communication Research (JSICR), Research Awards of the Social Science Field from The Telecommunications Advancement Foundation (TAF), and Research Students Awards of the Social Science Field from The Telecommunications Advancement Foundation (TAF). His research interests are in technology management, manufacturing and IT strategy, and global supply chain management.